Wow, did God ever do something so amazing today! Not that He doesn’t do amazing things every day….but today was without a doubt a divine appointment! God has continued to bless me as the week has passed by with better health. All that’s left from the Malaria are memories, which keeps me hoping I don’t get it again! I had my first and lets hope only bicycle wreck with minor injuries this week as well, so all in all I find myself starting this new week healed from them both! On Tuesday I went to one of the bush churches to teach. 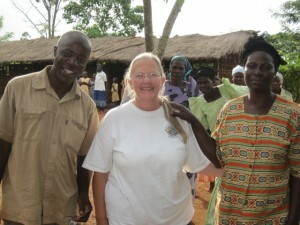 This church is called Syonga and Pastor Joseph and his wife Ana are very special to me. I first met them when I was here last October and have been looking forward to having the time to go back and spend a day with them. It was such a great day. When we were traveling there on Tuesday morning I was still experiencing fatigue from the Malaria and I wasn’t sure how I would hold up teaching all day. Yet, I had nothing to worry about, our Heavenly Father took great care of me and once I started teaching, I didn’t notice anymore that my body was tired! I had a good night’s rest and have enjoyed a quiet restful day without many effects left from the Malaria with the exception of fatigue. No relapse symptoms thus far and I continue to pray that none will occur. Holy Spirit and I along with my bible have taken an incredible journey through Esther today….preparing to teach tomorrow, Lord willingly that I am able to go on as scheduled. Since I have been serving here in Africa, God has allowed me to share the gospel everywhere I go and teach. All along the way there have been those who pray and accept Jesus as their personal Lord and Savior, but today is a day I will not soon forget. I went and taught today in a bush church in the middle of nowhere. The church meets under the shade of a tree. There are no structures at all. They have been meeting there for over 2 years now and the church is growing. 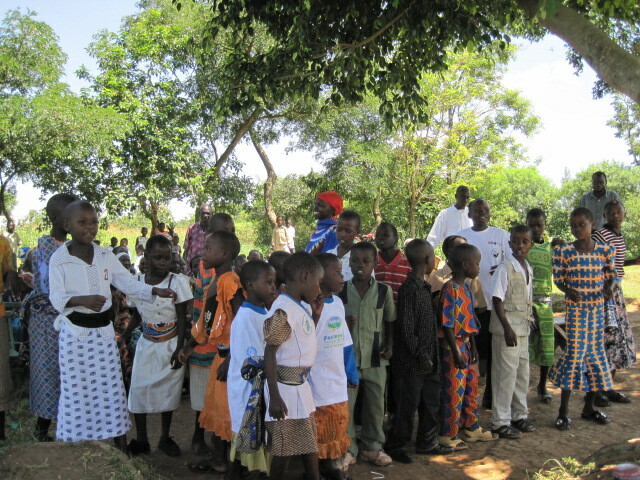 They have started an orphan school that holds class every weekday under the shade of that tree. 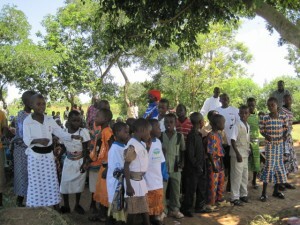 They have about 60 orphans that come every day. They sang a song for me when I arrived and I took this picture of them. I can’t believe it’s been almost two weeks since I last wrote an update. The days are over before I know it and then a week passes by. It seems impossible that I have already been in Africa 3 months! Without a doubt I am settling in and feeling more at home here. The Life and Mission of Joy Breedlove is powered by	WordPress 3.4.2 and delivered to you in 0.169 seconds using 38 queries.